The new TUDOR Heritage Black Bay is steeped in the mysterious aura of a hidden bay that gradually yields its secrets to those who venture there, a long-lost treasure returning to the light of day. It is the latest addition to the Tudor Heritage collection launched in 2010 which is aimed at drawing together some of the brand’s emblematic models, inspired by its past and revisited. The Heritage Black Bay is a perfect embodiment of TUDOR’s vintage spirit. 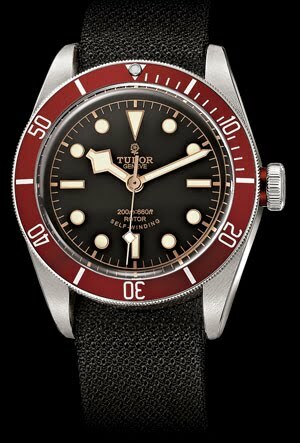 While it is a comprehensive response to today’s stylistic aspirations, the TUDOR Heritage Black Bay is inspired by a diving model that first appeared in 1954 and continually evolved until the 1980s. Its domed dial − an exquisite vintage detail − unusual burgundy colour bezel and “snowflake” hands all helped build the reputation of this iconic model during a period that saw the emergence of the very first divers’ watches. Although it temptingly retains a small part of mystery, like any treasure emerging from the bottom of the sea, the Heritage Black Bay model does yield many of its secrets. Starting with its lines, inspired by the 1954 model, and its slender, elongated lugs, reworked and resized to produce a contemporary steel case with a diameter of 41 mm, waterproof to 200 metres (660 feet) and enhanced by a domed crystal. The black dial, which is also elegantly domed, displays generous luminescent hour markers for perfect visibility. Like that of the hour markers, the pink gold of the hands represents a gentle hint of nostalgia, suggesting the characteristic patina of older timepieces. The burgundy colour of the unidirectional rotatable bezel, an original feature exclusive to TUDOR – faithful to the original 1970s models – is given a matt finish here, to beautiful effect. As attention to detail is always important to TUDOR, a similar touch of burgundy red appears on the insert of the winding crown, which is engraved with the TUDOR rose. Equipped with the new folding clasp developed by TUDOR, the Heritage Black Bay model is delivered with a black fabric strap and a steel bracelet, or with a black fabric strap and a second strap in exclusive aged leather: another original touch for an elegant, contemporary watch.